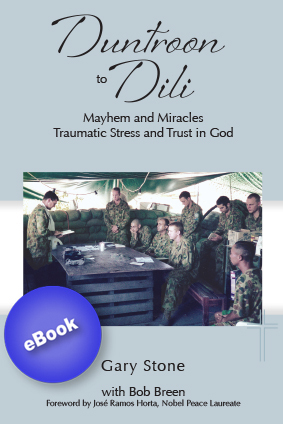 Duntroon to Dili is a compelling story of a man who has committed his life to the service of others.Gary graduated from the Royal Military College Duntroon and his service as a peacemaker has exposed him to considerable danger and personal trauma. Dramatic experiences in the Iran-Iraq war saw him develop Post-Traumatic Stress Disorder. Gary chronicles his own struggle and management of this illness, and his parallel ministry to other veterans similarly affected. Despite being a distinguished graduate of senior military staff colleges and with a wealth of experience as an Infantry Officer, Gary gave up his promising military career to train and be ordained as a Deacon in the Catholic Church. In his new vocation, Gary served as Chaplain in both the Australian Army and Federal Police, with multiple deployments to Timor-Leste, The Solomon Islands, Bougainville and the Asian Tsunami of 2004. He also continued to be an active leader in a wide range of communities that he has been a part of, as well as an outspoken advocate for peace, justice and morality. Gary Stone’s journey will take you through a life of adventure around the world. It is a powerful testament of a man who says 'Yes' to God’s call of service to humanity; a story of a man who does not back away from a challenge regardless of the risk or magnitude.